​My work was selected for the Annual Summer Exhibition from OffenhausLive, a international on line platform which aims to showcase artists and creative professionals from across the artistic spectrum. ​​POTTERY WORKSHOP - "When I perhaps compounded am with Clay"
I will be running a hands-on pottery workshop as part of the Leeds International Medieval Congress. An opportunity to create and decorate an Anglo-Saxon funerary urn using the coil building technique and decorate using bosses, stamps and freehand designs and motifs. Eight artists working in a range of different mediums have collaborated in an innovative art project. Each artist has produced work in their own medium and then passed it on to another artist in the group. They in turn have created a new piece inspired by the original and then their piece is passed to the next artist until each has produced 7 new pieces plus their own original. 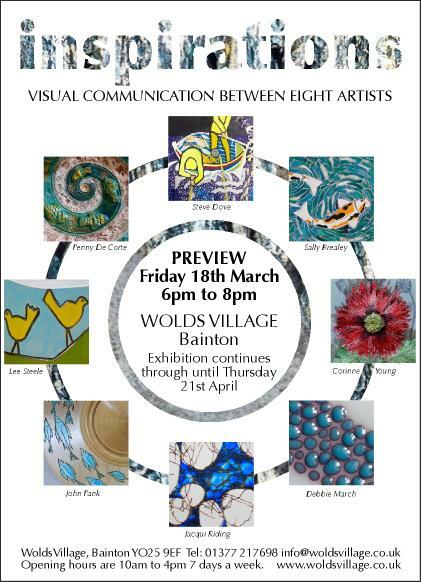 And now the resulting 64 unique pieces of art work created during the 12 month long project will be exhibited together for the first time at the Wolds Village Gallery. ﻿The Inspirations exhibition (selling) will run from Saturday 19th March 2016 to Thursday 21st April 2016 at the Wolds Village Art Gallery. The gallery will be open between 10am and 4pm each day. The preview evening will be on Friday 18th March commencing at 6pm. Please contact the Wolds Village at 01377 217698 for more details.